Navi Pillay’s visit to Sri Lanka, what does this mean to the Tamils? 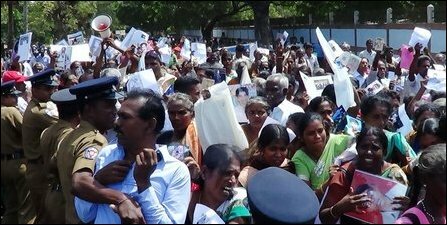 Home » Navi Pillay’s visit to Sri Lanka, what does this mean to the Tamils? Navanethem Pillay (Navi Pillay), High Commissioner for United Nations Human Rights visited the genocidal state of Sri Lanka to assess the progress it has been making in the post-war era, i.e. post-Mullivaaikkaal. She is due to give an oral report on the findings from this visit in late-September and a fully written report in March next year. But before this is done, let us take a look at what we can gather from her visit and the press conference held in Colombo. During her visit she held discussions with President Mahinda Rajapaksa and senior members of the Government, as well as politicians who are not part of the current Government, such as with the leader of TNA. In the press conference held in Colombo she accuses the LTTE as a “murderous” and “ruthless” organisation, and states that the diaspora must recognise that there should be “no place for glorification” for the LTTE. Yet she fails to recognise the acts of genocide, such as the anti-Tamil pogroms of 1983, which were undertaken by successive regimes of the Sinhala-chauvinist state time and time again since ’independence’ and in whole completely ignores the cause and roots of the conflict. Navi Pillay talks about the “trauma” she has seen among the people and the war survivors, those “scratching out a living” in war-torn Mullaitivu. She states that the reconstruction achievements are “indeed impressive” in the North and East and that she “understands the Government’s concern” the Government’s concern” that they perhaps have not been “sufficiently recognised”, but this was not enough and that a “more holistic approach” was needed. Some of the issues she mentioned includes, degree of military presence and their involvement in civilian activities, sexual abuse on women, and land grabs. 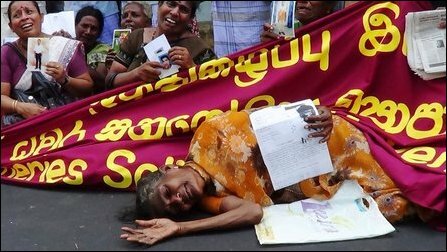 What she failed to recognise was the on-going structural genocide faced by the Tamil nation in the form of acts such as Sinhalisation. Navi Pillay in her talk “urge(d) the Government to speed up its efforts to demilitarize” the North and the East. After so many complaints on sexual-abuse on Tamil women Navi Pillay says that she “challenged” the Secretary of Defence, to enforce a “zero tolerance policy” for sexual abuse, when it is the military that is committing these atrocities. Furthermore she fails to state that it is the women of the Tamil nation that are mostly subjected to this act of genocide. In fact throughout the statement she addresses her concerns on the lifestyle of “all Sri Lankans” and fails to realise that it is the Tamil Nation that is facing human rights violations and acts of genocide. Navi Pillay referring ‘genocide’ as a legal term is unethical when colonisation, militarisation , forced disappearances and systematic sexual abuse on the Tamil Nation all amount to genocide. It is very clear through the statement Navi Pillay released at the press conference and the interview she did with News1st Sri Lanka that Navi Pillay has only expressed her concerns on a small proportion of the genocide faced by the Tamil nation in the island of Sri Lanka, which of course without defining these atrocities using the word ‘genocide’ itself. Instead, when she is questioned on her views on claims which state that ‘genocide’ is taking place she says that “there has to be proof of an intent to destroy” and that this can only be judged after “proper investigations”. Nevertheless, when questioned about what she will be taking back to Geneva from this visit she states that there is “no genuine reconciliation process” and “no genuine accountability process”. She states that the next steps should arise from “an inter-governmental body”. She apparently recognises the failure of “international investigation to provide justice”, but does nothing to enforce it even on this visit. So what is it that us Tamils get after all from the protectors of human rights, i.e. the UN after yet another visit? Well the oppressed Tamil Nation is once again left to watch the world give the weapon of genocide, time and space, to the Sinhala-Buddhist, chauvinist state of Sri Lanka to perpetrate even more acts of genocide in the name of ‘genuine reconciliation’ through the implementation of the LLRC. Now let’s not forget that these ‘Gods’ of the ‘rule of Law’ “encourage (Sri Lanka) to do more”, “acknowledge that they done a great deal” and will have “ongoing cooperation” with the Government of Sri Lanka. Now let us say ‘Hello’ to the freedom of Tamils. Tamil Youth Organisation United Kingdom | Organisation address : 247 Lewisham Way,London,SE4 1XF. | Copyright © 2019 www.tyouk.org. All rights reserved.